Since times immemorial, India has been synonymous with spiritual knowledge and people have been drawn to her sacred land. Some were philosophers, poets, writers, historians, scientists, and travelers. Some came to India; others read translations about her rich and imaginative literature and felt genuine enthusiasm for her. The fourth Caliph in the 7th century is reported to have said - The land where books were first written and from where wisdom and knowledge sprang is India. Despite the wars and imperialism, ancient India's spiritual influence and wisdom has had considerable impact on the West, especially on its imagination, science, and literature: English Romantic poetry in particular. Preface; Acknowledgement; Foreword; Introduction; Philosophers; Writers; Historians; Political thinkes; Indologists; Teachers; Scientists; Poets. Scholars; Spiritual; Life; Artists; Industrialists; Afterword; References; Index. Sushama Londhe is an Indian American who came to the US as a graduate student in the mid-1970's. She holds masters degrees in Regional Planning and Urban Affairs. After working as an Urban Planner with the State of Connecticut, she decided to devote her time as a mother and a homemaker. 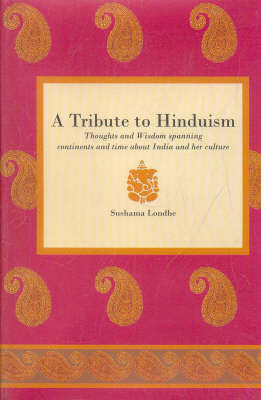 Subsequently, she began a website, Hindu Wisdom, as a personal quest for her own spiritual heritage.